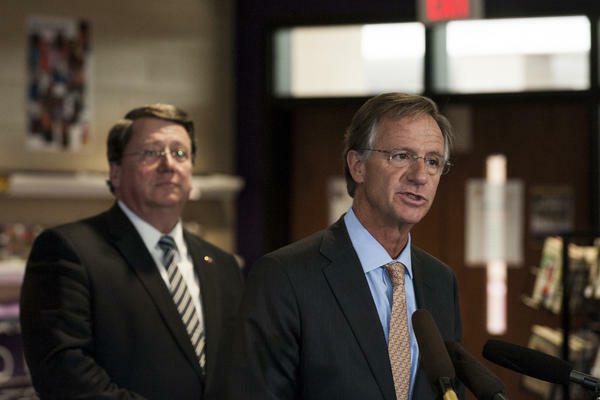 Tennessee Governor Bill Haslam (right) speaks at Cane Ridge High School while Senator Mark Norris looks on. A recent audit found that one in three high school graduates hadn't fulfilled the state's graduation requirements. The state requires graduates to take at least 22 high school credits, the report explains, "including four English and math courses, three science courses, four social studies courses, and two foreign language courses." Where were students coming up short? According to the report, "most commonly, students were missing either the two foreign language credits or the specific required social studies courses. For social studies, some students had taken a sufficient number of classes but failed to complete the exact courses specified by state policy." This comes just a few months after Tennessee took a bow for steadily improving its high school graduation rate. In the 2015-16 school year, the state raised its rate by nearly a percentage point, to 88.5 percent. So far, this is not yet a scandal as it was in Alabama when, late last year, the state's new superintendent of education criticized high schools for giving unearned diplomas and his own department for poor oversight, saying "this is not one of those situations where it's just smoke. There is in fact fire." "In working with our districts and in looking at the data, we just haven't seen evidence of that kind of bad behavior here yet," says Nate Schwartz, Tennessee's chief data officer for education. "It might still come out. And, if it comes out, I would argue that our willingness to publish this report about ourselves provides some evidence that we'd be willing to say it if we find it. But I don't think we've found it yet." Here's what they have found: Students were getting the correct number of credits in most cases — just not the right ones. Tennessee education officials blame the failure on a combination of factors, including data entry errors, a lack of teachers and counselors, and genuine misunderstandings about graduation requirements. In 28 percent of Tennessee high schools, fewer than half of graduates met the state's requirements. These were often smaller schools that, while they offered all the necessary courses, are less able to provide the structure, oversight and counseling needed to keep students on track. Students who failed to earn the proper requirements were less likely to enroll at a post-secondary institution the next fall. In Tennessee, most four-year schools require a foreign language for admission. "I sometimes ask questions that maybe people think I should know the answer to," said Wendy Tucker, a Tennessee State School Board member, during a recent presentation of the report to the board. "Are we saying that a third of our high school graduates didn't actually meet the requirements to graduate, under the law, but got diplomas?" Tucker, a former education adviser to Nashville's mayor, paused, incredulous. "I'm just having a hard time reconciling 'requirement' with 'didn't do it,' " she continued. "This could explain some of our post-secondary success issues if kids are graduating without actually meeting the requirements." Tennessee public school students' average score on the ACT college entrance exam is below both the national average and the state's own standard for college and career-readiness. Tennessee officials say the graduation problem now has their full attention and that it can't happen again. They're even looking into making it harder for students to get a waiver that allows them to bypass foreign language requirements. Education Commissioner Candice McQueen says she plans to take "some pretty drastic measures" to ensure a Tennessee diploma remains meaningful. As for the students who have already left the system underprepared, the state has no plans to reach out to them individually, either to let them know they failed to meet the state's requirements or to change the diploma they received. "It is a district's responsibility to verify students have met graduation requirements and issue diplomas," said Tennessee Education Department spokesperson Sara Gast. "And from the state's perspective, based on our current understanding of these situations, we would not retroactively revoke a student's diploma."